In the late 19th century, the American illustrator and publisher Benjamin Day developed a cost-effective printing technique that used dots in different densities to reproduce images on a mass scale. This process, named after its inventor, matured over the next century and was utilised to print newspapers, advertisements, and pulp comic books in the 1950s and 60s. Sigmar Polke (Germany, 1941–2010), Roy Lichtenstein (United States, 1923–1997), and Gerald Laing (United Kingdom, 1936–2011)—along with the rest of the world—devoured this imagery daily, and chose to reconfigure it in their works. 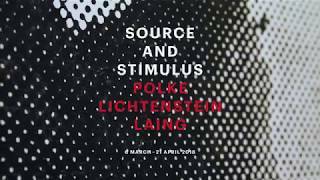 Source and Stimulus: Polke, Lichtenstein, Laing is an exhibition devoted to the Ben-Day dot. Featuring exceptional works by the legendary trio of artists, this is the first exhibition to connect them on the basis of their manipulation of the dot, transforming imagery from the commercial sphere into fine art. Taking its title from Laing’s 1964 exhibition at the Slade School of Fine Art, London, Source and Stimulus will highlight certain themes that recur in the works of all three artists, including the Space Race, sexual liberation, mass consumerism, and politics. 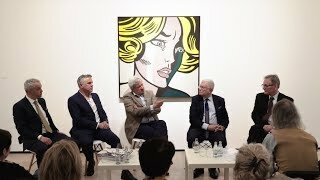 This transatlantic consideration of the 1960s Pop Art movement is both technical and thematic, affirming the enduring relevance of the visual vocabulary they created, in a time likewise shaped by sensationalism in the mass media.